Last fall, I finally made the move from iPhoto to Photos…months later, I still find myself frustrated by many things in the Photos’ user interface. Today’s aggravation dealt with cleaning up a bunch of older photo albums—some I just wanted to delete, others I wanted to convert from Smart Albums into normal albums (because I wouldn’t be adding any more photos that used the keywords in the Smart Album). That meant I wanted to delete a bunch of albums—well over 100. Deleting an album in Photos can only be done from either the My Albums overview, where you can select more than one (though not across folders), or via the contextual menu in the sidebar. The My Albums view wasn’t going to work for me, as I needed to look at and work with many of the albums, across many folders. But after the sixth time of doing the “right click, select Delete Album, tab to Delete in the confirmation dialog, press Return” dance, I was sick of it. Time for another Keyboard Maestro macro. This one is very simple—it just replicates the actions required to delete an album. With it in place, I click on the album I wish to delete, then press Control-D. It’s still more mouse interaction than I’d prefer—why can’t I select albums via the keyboard?—but it’s oh so much faster than using the contextual menu. Update: If you’re running macOS Sierra, ignore the rest of this tip because it’s irrelevant! I had no idea Shift-Command-Period would show/hide hidden files directly in Finder in macOS Sierra. Thanks to NaOH for the great tip via the comments! Basically, if you want to show invisible files in Finder in Sierra, pressing ⇧⌘-Period will toggle them between hidden and visible. Nice! 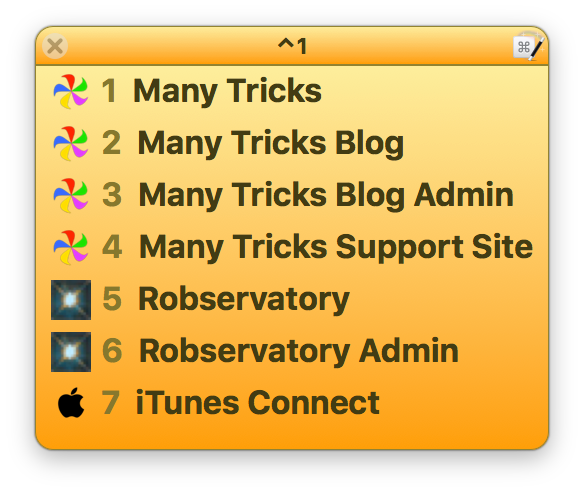 If you’re on an earlier version of macOS/OS X, however, you may find the macro version useful for easily showing and hiding hidden files in Finder. `brew install speedtest` is one of the best things I ever did on my Macs. `speedtest` from Terminal rocks. No flash, no browser. W00t! What is this speedtest exactly? And what is brew, you may also be wondering? You may also be wondering why, if you have brew, Dave’s command doesn’t work…that’s because it’s actually brew install speedtest_cli…but I’m getting ahead of myself. speedtest is a command line interface (i.e. Unix app run from Terminal) to the connection speed tests at Speedtest.net—you get the results without the fancy animated graphics. And Brew is “the missing package manager for macOS.” In other words, it’s an app to help you install (and uninstall) other apps. This post was originally published in Decwember of 2016. I took it down to replace one section (using repeats) with another (using groups), and to expand some other areas. I’ve been using Keyboard Maestro (or KM for short) a lot lately, i.e. Create an iTunes song info window or A much improved special character palette, or a slew of others. 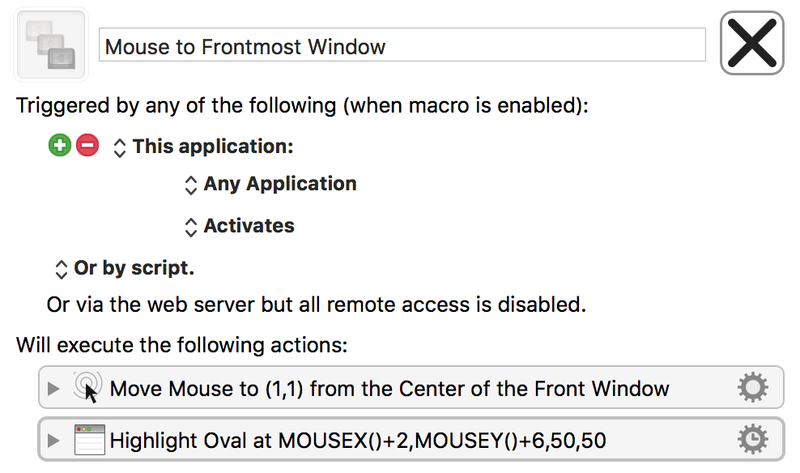 As my collection of macros has grown, and some of those macros have gotten more complex, I’ve been using a few of KM’s features to help keep my macros organized, and make it easier to debug them while I’m working on them. Some of these are obvious, some maybe not so obvious, so I thought I’d share what I’m doing. Yes, I posted a non-https image in the ‘site is secure’ post. Sigh. 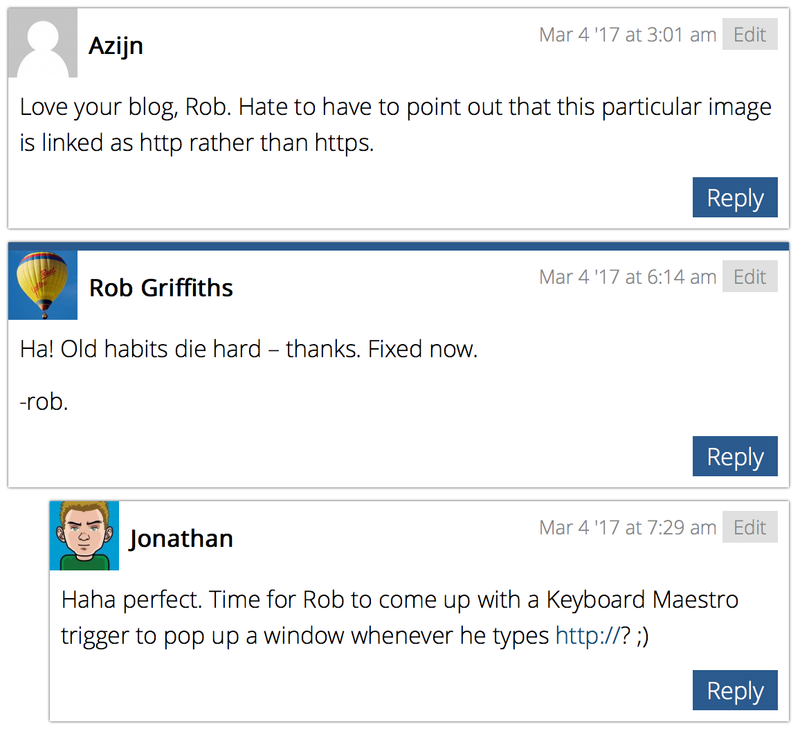 So I took Jonathan’s comment to heart, and created a Keyboard Maestro macro that ensures I post only relative URLs from now on. I was working on something with Peter about Moom and its disk usage (it doesn’t use much), and I was curious as to just how long Moom had been running on my Mac. I last rebooted my Mac a week ago, but I often quit and relaunch our own apps to run test versions. Click once on the app or process of interest. Press Command-I or click the small ‘i’ icon in the toolbar. In the new window that opens, click Sample, then wait. That’s all fine if you’re in Activity Monitor, but a bit of a pain if you need to launch it, find the app, run a sample, etc. As you might expect, there’s another way via Terminal: The lsappinfo command, which queries CoreApplicationServices about any app or process on your Mac. 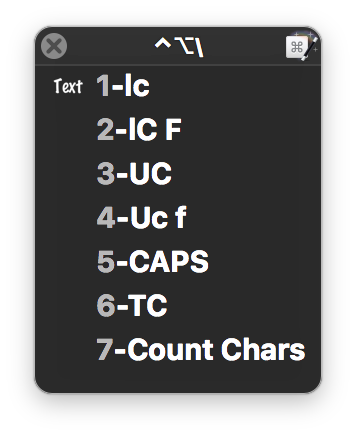 Today in The Mac Observer Melissa Holt wrote about using the TextEdit/ Edit/ Transformations command to change the case of a sentence or paragraph. However, there is no option to perform, “Sentence Case”, i.e., capitalize the first letter of the first word, and keep all other words in lower case. Is there a way in Terminal, or maybe Keyboard Maestro to add this option to Transformations? It seems to me that the given choices have rather limited uses. Not all apps have a Transformations menu. Only three very basic transformations (upper, lower, capitalize) are supported. The transformations are buried in a sub-menu, requiring lots of mouse navigation to reach. While I don’t believe it’s possible to modify the Transformations menu, it’s pretty easy to use Keyboard Maestro to build a “Sentence Case” transformation…or more usefully, as seen at right, a palette with many more transformations. Unlike the Transformations menu, the Keyboard Maestro solution will work in any app where you can copy and paste text.